I get how hard blog design is. It has taken me ages to get anywhere near a good looking blog and I still think I could do better on some points! When you start up a blog you get so many things that you need to learn about if you want to run it like a successful business. The design side is one of these things. Learning design is a whole different story. Luckily, there are many blogs dedicated to just that. 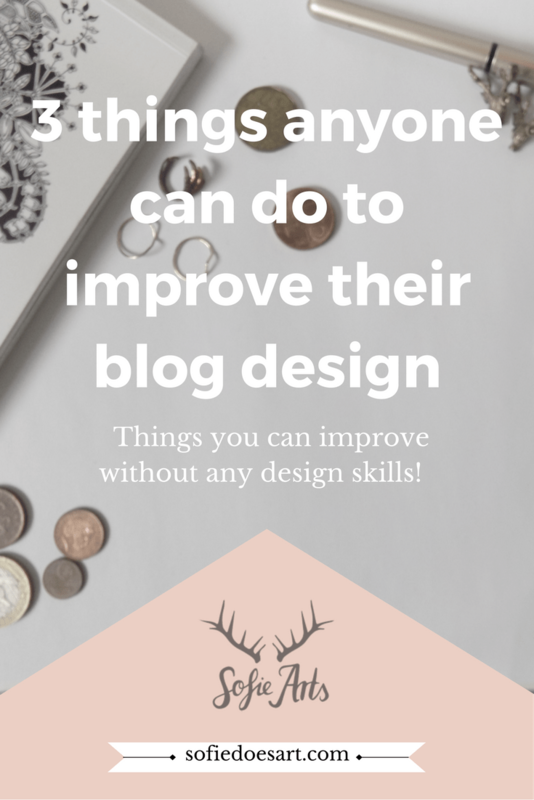 But before you have learned any blog design there already some things you can check for your design. One of my biggest flaws is using unreadable fonts or colours. I never realised. Just how important instant readability is. If you can’t scan an image and read the letter immediately you are doing it wrong. A top tip for this is using high contrast colours on your backgrounds. So if you have dark coloured pictures use bright/light colours like white! Also, Just for reference, most people find sans serif fonts easier to read quickly. If you want to check the readability of your blog and images try looking from a little further away! Another thing to think about is if your design stands out. One of my best ways to check this for my social media posts is seeing of they stand out in a feed. Amazing for this is for example Pinterest. If your images stand out in a Pinterest image feed you know you are doing design well. A few things you can try out to achieve this are incorporating bright colours and white space. Bright colours are easy to why they would help, they simply stand out more. If you have a brand that does not have any bright colours in their colour scheme, try picking some of the lightest colours or try incorporating high contrast in you images. White space is especially important for photos with text over them. The white space does stand out. (White space is empty space in an image but not necessarily white!) But it is also important to note that white space makes it easier to read the text. Again, try this easy trick of pinning your own image and looking at in a group of pins. Does it stand out in any way? Lastly, even if you are still working on your brand there is one thing very important. Consistency. Try to keep the feel of your brand consistent. I think this goes further than just using the colours and fonts you chose. Having a brand feel includes trying to stay away from things, styles and more that doesn’t fit this brand idea. My trick for this is to simply look at new things I design next to some old things. Does this look like the same brand? It could definitely be the same brand but a little bit more polished or modern. But I just need that same feel! These things you can check for you blog design before learning anything at all about design in general. It is a great starting point for those who are just beginning. But also while having your blog for years, these things can still slip through so do check regularly! Let’s talk design; Which part of design do you personally struggle most with? Apart from the colours, fonts and such, I find it really hard to place things right and to make them look professional!